From magnifying glasses to tinted windows to one-way mirrors, people prize glass for its ability to transmit (or not transmit) light. Measuring light transmission and transmittance plays a huge role in selecting an appropriate type of glass for your needs. Transmittance measures the amount of light able to pass through a material without the material reflecting or absorbing it. Therefore, transparent glass will transmit 100% of light, translucent material only allows some light to come through, and opaque glass will achieve close to 0% transmittance. A few key differences exist between light transmission and transmittance. Understanding the distinction between these two terms will help you select the perfect type of glass for your application. Transmission refers to the amount of incident light that successfully passes through glass or other material, and it’s usually expressed as a percentage of light that made it through the material. On the other hand, transmittance refers to the amount of light that a material disperses, effectively resulting in an inverse value of that found for transmission. External transmission is calculated from the intensity of the incident light as it enters the glass versus the light’s intensity after exiting the glass. This transmission measurement technique provides an accurate figure of the actual amount of light allowed to pass through a material. Internal transmission is determined by the light’s intensity once it has entered the glass versus its intensity after it leaves the glass. Internal transmission primarily measures the light filtration ability of the glass itself, allowing you to get a more accurate idea of the glass’s properties. Transmittance refers to the amount of light energy that the glass absorbs, scatters, or reflects. It’s measured using the formula T = I/I0, with T denoting the transmission intensity, I indicating intensity, and I0 indicating intensity at the start. This calculation allows you to determine the ratio of transmitted radiant power to incident radiant power, giving a greater idea of a glass’s ability to block photons. How Does Transmittance Apply to My Application? Transmittance values can vary based on which application or common industry nomenclature they use. For example, while most manufacturers measure industrial glasses in terms of external transmittance, they usually measure filter glasses in internal transmittance. This is because manufacturers can put an anti-reflective (AR) coating on the glass’s surface, reducing the amount of light intensity lost to reflection. Testing window tint or films for cars, homes, and businesses. Desired tint levels will correspond with the amount of light the glass transmits. Measuring glass clarity. Many industries have stringent specifications governing the use of glass in assembly regarding both external or internal transmission. For instance, FAA specifications for airport and aerospace applications typically govern the product’s external transmission potential. It’s also good to keep in mind that engineers who design optics for extreme environments must recognize that each type of glass will have slight variations in chemical, thermal, and mechanical properties, all of which factor into their ability to reflect and absorb light. At Swift Glass, we pride ourselves on having delivered industry-leading custom glass manufacturing services for almost 100 years to OEMs across the country. Our experience and dedication to customer success enables us to understand our customers’ intricate needs and exceed their expectations. We’re an ITAR-registered, ISO 9001:2015–certified company and a worldwide leader in fabricated glass parts. We offer holistic assistance in glass crafting, material selection, and custom design, maintaining a high standard of precision and quality. 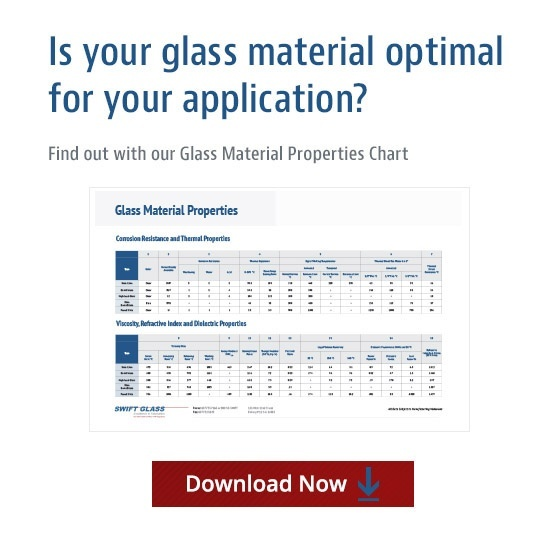 To learn more about the optical properties of glass, download our latest eBook here, and don’t hesitate to contact us today if you have any questions. The differences between low-iron and traditional clear glass are pronounced enough that many people can’t believe what they’re seeing – or what they haven’t been – when they’re shown low-iron glass options. Traditional clear glass can be hazy and is often faintly tinted, even at its best. Color issues may arise on the edges of thicker pieces and light often isn’t allowed to truly penetrate the glass due to its chemical makeup. Conversely, low-iron glass offers a practical solution to common problems associated with traditional clear glass. Glass that is specially manufactured to have a low iron content can shed the bulk of the color casting (tinting) that comes along with traditional glassmaking methods. This lack of color provides exceptional clarity and top-notch light transmission. Low-iron glass, also known as optically clear glass, is made from silica and contains very low amounts of iron. The low iron levels serve to remove the blueish tint that’s associated with thicker traditional glass. Low-iron glass sees wide use in solar applications and is also popular in the aquarium and display industries, where clarity is valued. Low-iron glass usually has a ferric oxide content about ten times less than ordinary plate glass. Iron is intentionally lowered through the use of special silica sand with naturally low iron levels. This low iron content is what provides the glass with exceptional color neutrality and clarity. Traditional glass typically has a ferric oxide content of close to 0.1%. This oxide is one of three key iron oxides of iron. Manufacturers have managed to get ferric oxide levels down to just 0.01% in low-iron glass. Standard clear glass’s higher iron content means that it has a blue-green tinge. For those looking to back-paint or coat their glass, low-iron options should not be overlooked. The green hues associated with traditional clear glass can become problematic in terms of aesthetic appeal, as the edges of thicker pieces of glass can often times appear nearly black, creating both an eyesore and color problems. This can create conflicting color problems when painting. Low-iron glass boasts virtually no color tint. It offers individuals and businesses alike the opportunity to color-match their glass and ensure that it remains aesthetically pleasing. A clearer starting point means less work with color-matching when you need to paint your glass. While even low-iron products will continue to have a hint of color to them, it has been found that smaller pieces will generally exhibit far less tint than larger ones. Light transparency can be improved by up to 6% simply through the modification of iron content in glass. Low-iron glass provides maximum brightness and clarity with a higher visible light transmittance than traditional clear glass. Applications requiring an unrestricted view can see tremendous improvement with the use of low-iron glass over more traditional options. Low-iron glass achieves these optimum levels of clarity thanks to its iron levels; light transmission levels will virtually never dip below 90% with low-iron glass. Light transmission is not perfect in low-iron glass, though thinner cuts of low-iron glass will boast more impressive light transmission levels than those that are thicker. One should also consider that between two cuts identical in thickness; however, low-iron glass will always win out over traditional clear glass in terms of light transmission. At Swift Glass, our experts will guide you through the process of selecting an appropriate low-iron glass solution for your home or your business. For a wide range of applications, low-iron options are the superior choice for those in need of clarity. If you’re interested in incorporating low-iron glass into your personal or business endeavors, feel free to contact us for more information or to learn more about our optical display glass materials. Understanding the behavior of light can be an important factor when determining which glass materials to use for your manufacturing process. When light passes through a substance, it decreases in velocity. This is manifested by an increase in the substance’s refractive index. Much can be learned about the optical properties of a glass material by looking at its refractive index. Refractive index is useful for various reasons. For one thing, it can be used to calculate the focusing power of lenses and the dispersive power of prisms. It can also be used in estimating the thermophysical properties of hydrocarbons and petroleum mixtures. Also commonly referred to as the index of refraction, the refractive index, n, measures a ray of light as it travels from one medium to another. As it begins to travel through a material, the interaction between electrons and photons reduces the speed of light. As the density of the electrons increase, the velocity of light becomes slower. This is why light moves at its highest possible speed in a vacuum, where no electrons hamper its speed. Knowing the refractive index – among other thermal, chemical and physical properties – helps ensure that the glass material you’re considering for your application is suitable for its intended use. The ratio between the speed of light in a vacuum and the lower velocity of the light as it travels through a given material enables us to determine the refractive index of a given material. In addition, the amounts of transmitted and reflected light will determine not only the refractive index of a glass material, but also its angle of refraction. This is because light gets transmitted and reflected as light rays pass through the surface of a glass material. The discrepancy between the light’s transmission and the incidence angle becomes bigger as the index of refraction becomes larger. When this occurs, there is a change in the existing refractive index between the glass and the surrounding medium. Lastly, the intensity of light is reduced by an average of 4% due to lost reflection from the surface of most glass materials with a 1.5 refractive index. A change in the index of refraction due to changes in wavelength is known as chromatic dispersion. Swift Glass has been providing custom glass manufacturing services for nearly a century, and providing high-quality solutions to OEMs is one of our core principles. Our experience and dedication to customer service enables us to understand the intricate needs of our customers, and to exceed their basic needs. An ITAR registered, ISO 9001:2015 certified company, Swift Glass is a privately-owned global leader in the quality fabricated glass parts. Swift Glass offers assistance in craftsmanship, material selection, and manufacturing of custom solutions, and design, while guaranteeing high quality and precision. To learn more about the optical properties of glass, download our latest eBook, Understanding the Optical Properties of Glass today! We’re excited to announce that Swift Glass now offers custom cutting and precision grinding glass fabrication services for Gorilla® Glass. Swift Glass’s advanced technology can transform Gorilla® Glass with custom waterjet cutting and glass cutting, edge grinding and beveling, and even additional chemical strengthening for protection against extreme environments. The Swift Glass/Corning partnership rests firmly in both companies’ long histories of innovation. Corning’s research has delivered social breakthroughs from the glass for the original Edison light bulb to the first low-loss optical telecommunications fiber, while Swift’s manufacturing technology has provided groundbreaking solutions in optics, aerospace applications, biomedical technology, and more. Swift Glass provides more than just cutting, grinding, thermal tempering and chemical strengthening services. Its company-wide commitment to excellence ensures quality solutions from initial material selection all the way to final inspection and packaging. For more information on Corning Gorilla® Glass and Swift’s portfolio of specialty materials and manufacturing services, visit the Gorilla® Glass capabilities page on Swift Glass’s website or contact the Swift Glass Company online to request a quote. If you’ve ever wondered why your glass order was quoted at a certain number, you are not alone. “What makes up the cost of my glass?” is one of the most common questions we get here at Swift Glass. There are a variety of factors that contribute to the price of a glass part — the quantity of the order and the size of your glass piece being the two most obvious factors. Here are three other notable considerations. Advances in manufacturing technology have led to advances in glass shaping capabilities. Processes like state-of-the-art glass drilling, waterjet cutting, and computer numerical control (CNC) machining can all be applied to glass shaping. Today, glass parts can have virtually any shape, from standards like squares and circles to highly complex organic, irregular, and geometrical shapes. The more complex the shape of your glass, however, the more advanced technologies required to produce it. The use of advanced machining processes adds to your glass prices. There are many different forms of edgework that you could specify for your glass part, and they all have an impact on the price of glass. The most basic edgework, a simple cut, is required for virtually every glass part as a matter of course, and will have minimal to no impact on the cost of glass. Cut and swipe, a swipe being a very slight bevel, will increase your glass price modestly. Very complex edge grinding, such as special or custom bevels, could increase the cost of glass considerably. Strengthening and tempering procedures — additional steps performed after your parts are cut — increase your glass prices. If your glass parts are going to be used in a challenging environment and face exposure to extreme heat, pressure, stresses, or chemicals, a strengthening processes is likely required. Chemical strengthening processes are best for glass that will encounter wind load and thermal stress, while thermal tempering is ideal for glass that will be used in high pressure, high heat, and explosive environments. The glass price factors here are only a small sample — there are dozens of considerations that go into the price of a glass quote. To learn more about the different ways glass cost is determined, download Swift Glass’s latest guide, What Affects the Price of My Glass? LED lights and lighting systems are becoming increasingly common in the lighting industry. The rise in the use of LED lights by commercial building owners and managers, and industrial manufacturers is due in part to the federal government’s energy efficiency standards. Updated periodically by the Department of Energy, new efficiency standards in 2012 require lights to use 25% less energy. More importantly, commercial and manufacturing spaces are also realizing that using LED lighting carries a great number of benefits. LEDs, or light-emitting diodes, use a semiconductor as a light source. In short, voltage applied to the semiconductor prompts electrons to jump from one atom into an electron hole, an atom with a missing electron. This recombination releases energy in the form of visible light photons. The primary benefit of LED lights is their incredible energy efficiency, using as much as 90% less power than standard bulbs. LED bulbs have vastly greater lifespans than standard bulbs, lasting up to 40 times longer — an average of 50,000 hours as compared to about 1,500 hours for incandescent bulbs. Related to lifespan is their increased durability — the diode is encased in epoxy resin, making it much sturdier than the thin filaments of incandescent lights. They are resistant to shocks, impacts, and vibrations, so they are much harder to break. Their durability also allows for their use in extremely cold and extremely hot applications. LED lighting and lighting systems are being used in a variety of applications. Household use is increasing, as is commercial and industrial usage. But there are other interesting usages arising, as well. One of these is in sports arenas. It was long believed to be impossible to light large venues with LED lights, but that has proven to be very false — in 2015, roughly 90% of all large-scale sporting venue operators that installed new lighting systems opted for LED lighting systems. Sports teams across the nation have saved millions of dollars in electricity costs after making the switch. Another unexpected application for LED lighting has been museums. The University of Oxford’s Pitt Rivers Museum, as an example, switched to LED lighting as part of an effort to reduce its carbon footprint. They’re expected to eliminate 44 tons of carbon from their footprint, not to mention their expected savings up to $64,000, over the next 5 years. As an added bonus, LED lights generate no ultraviolet light at all, protecting the museum’s delicate artifacts from UV damage. Having been manufacturing glass for the lighting industry for more than 80 years, Swift Glass is a nationally recognized expert in lighting glass — including LED lighting glass. We’ve manufactured glass for major LED installers using specialty glass. We can also offer thermal tempering for added strength. These capabilities, and more, make Swift Glass ideal for manufacturing glass applications for LED lighting and lighting systems. Visit our lighting applications page for more information about our LED lighting glass capabilities, or contact us today. Reshoring manufacturing jobs back to the United States from overseas is a trend we’ve been seeing over the past several years, and one that’s sure to continue into the near future. According to a recent Boston Consulting Group (BCG) report, the U.S. gained 10,000 reshored manufacturing jobs in 2014, and hundreds of companies will follow suit in the coming years. Reshoring is becoming more popular for manufacturers across the country as they recognize the true cost of working with offshore factories. Long lead times, poor communication, high transportation costs, huge shipping risks, lower product quality, and a closing wage gap abroad are just a few of the many factors pushing us towards a reshoring initiative. Overseas manufacturing does not always guarantee the same quality standards like ISO, for example, with which domestic manufacturers are expected to comply. As a result, product quality can be lower in comparison. In addition to the recent increased labor cost trend in China, overseas manufacturing naturally requires greater shipping costs. By moving manufacturing back home, we can reduce these shipping costs while maintaining wage expenses. Reshoring creates more jobs at home and invigorates the U.S. economy. Housing every step of production under a domestic roof increases agility and autonomy, which in turn cuts down on order lead times. The lengthy hassle of dealing with overseas shipping that can add weeks or even months to a product’s time to market will be avoided. Here at Swift Glass, we’re proud to support the recent reshoring trend in American manufacturing and the positive impact it has had on our economy. Located in Elmira, New York, Swift Glass has provided industries across the country with glass fabrication services for nearly 100 years — and hope to provide the same level of service and quality for 100 more. Thank you to all of our customers for their continued support of Swift Glass, and for customers everywhere who are creating more reshoring opportunities. How Is Glass Involved in 3D Printing? 3D printing, also called additive manufacturing, is rapidly transforming industrial manufacturing as we know it. Initially used to create models and prototypes, 3D printing is now increasingly being used to construct finished products. In the near future, this technology will hold the power to manufacture food, cars, implants, and even soft tissue organs. The 3D printing process uses computer-automated layering of material to create a three-dimensional object. Just about any material available in liquid or powder form can be 3D printed. The industrial robots performing the layering can be programmed with complex shapes and geometries to produce a diverse range of parts with extreme precision and detail. Where Does Glass Fit In? During the 3D printing process, the object being created requires a platform on which to rest. Because of the high temperatures experienced during 3D printing, this plate must be made from durable, heat-resistant materials. Borosilicate – a glass substance constituted of silica and boron oxide – is the material of choice for these applications. An extremely low coefficient of thermal expansion makes borosilicate more resistant to thermal shock than any other common glass. Even when exposed to high temperatures (up to 500°F or 260° C), borosilicate remains durable and clear without losing functionality. Swift Glass has been a worldwide leader in custom glass fabrication for almost 100 years. In addition to waterjet cutting, glass tempering, polishing, grinding, lapping, and drilling services, we offer a variety of borosilicate and infrared reflecting borosilicate (IRR) glass from major manufacturers such as Corning and Schott. For more information about Swift Glass and our offering of glass for 3D printing, please visit our borosilicate materials page. You can also check out our latest eBook about strengthened glass called Creating Glass That Withstands Extreme Environments. High-intensity industrial processes call for durable equipment that will prove resistant in the face of even the toughest of applications. If you’re carrying out procedures against harsh or extreme conditions, it’s essential that your application is equipped with the proper glass component. Tempered safety glass in windshields, for example, provides extra security in the event of breakage. High performance glass is required to withstand a vast range of pressures, elements, and external factors, each of which vary by industry. When operating in high intensity environments susceptible to extraneous factors, it’s important to be aware of common concerns that can arise. One of the most frequently noted stress points for high performance glass, this can manifest itself in marine, architectural, and even aeronautical environments. Strengthened glass, however, can help prevent or reduce the adverse effects of high pressure. In addition, strengthened glass helps shield your work environment from harm caused by explosions, bullets, and projectile aftermath, each of which may pose a threat to safety and productivity. Safety glass offerings, like tempering, can help to ensure a less devastating effect upon impact than with regular glass. Exposure to extreme temperatures can result in potentially adverse effects upon operations. Fortunately, heat-treated glasses can offer dramatically increased protection against hazards like thermal shock. Heat treatment offers glass—a material often susceptible to high temperatures—increased protection against high-temperature breakage. Exposure to intense, abrasive elements or harsh, wet and extreme environments holds the potential to work against high performance glass. For certain extreme or outdoor environments, heat-tempered glass may not be necessary, but it can provide exceptional resistance against thermal stresses and extreme wind pressure. Fully tempered glass, however, can offer unparalleled safety when it comes to ensuring safety break pattern. If operations are under harsh weather conditions, tempered glass ensures your work environment remains both active and safe. At Swift Glass, we’re dedicated to providing consumers with the high quality materials they need for safe, efficient, and effective day-to-day procedures. For additional information regarding glass strengthening solutions, access our new eBook titled Creating Glass That Withstands Extreme Environments.